Oh, I wish I had thought of this idea – so simple, but so awesome: a tumblr that tells you what would happen if famous authors and characters ordered a drink at Starbucks. The brainchild of a few English and History majors, no wonder the Blog Literary Starbucks has a cult following. Coffee and Literature, there is nothing better. An entertaining read that made me giggle and snuffle and quietly feel pretentious when I understand a highbrow literary reference (what else are book tumblrs for, right?). Below are my favourite posts, but make sure you read the rest. Lyra goes up to the counter and orders an ever-morphing drink. 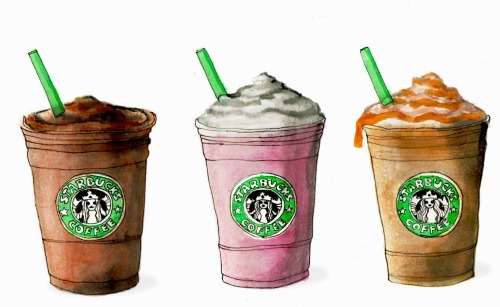 In rapid succession, it is a frappuccino, an espresso, a cappuccino, a cup of tea. The grey-eyed barista picks up the drink and hands it to Lyra. It never changes again. Haruki Murakami goes up to the counter and tries to order something off of Starbucks’ secret menu. The notion that there might be a secret menu surprises the barista, who has never heard of such a thing. Murakami is disappointed, but not particularly surprised, and decides to order a glass of steamed milk with a squirt of cinnamon syrup. While waiting by the counter, he listens to the jazz coming through the speakers, taps his foot, and remembers when he used to run a coffee shop. That had been a good time. He is so distracted by the past that he doesn’t notice when a small cat begins to lap up his order. He snaps out of his reverie and chases the cat off. Later in the day, he goes looking for the cat, hoping to make reparations. He never finds it. Phillip Pullman goes up to the counter and orders three shaken sweet teas. He sits down and drinks them despite angry patrons yelling at him that his tea-drinking is offensive to their coffee-drinking. Finally, he finishes them. It is the most satisfying finish to a set of drinks in the history of drinking. Every other patron who wishes to drink from Starbucks should consider Pullman’s drinking history the standard for which to aspire to. Nancy Drew calmly strolls up to the counter, orders a stiff drink, and relaxes in the corner while poring over what appears to be an ancient book. Twenty minutes later, the Hardy Boys run breathlessly into the shop, rejoicing at their physical fortitude and apparent genius at having solved yet another alliterative mystery: the Location of the Lost Latte Lagoon. The barista points over to Nancy Drew, who tips her glass to the two sweaty gentlemen and nonchalantly goes back to her book. Daisy goes up to the counter and orders the drink society expects and has pressured her into ordering. Everyone hates her for it anyway. A man clad in Elizabethan gear goes up the the counter, hoping to order an Earl Grey tea. No one is behind the counter, until – what’s that? – a jolly spirit clad all in green leaps onto the counter and begins working on an enormous concoction of coffee, cocoa, tea, ice, and various flavored syrups. The man asks for the strange barista’s name, but the creature only laughs. The man will love the drink once he has tasted it. What fools these mortals be. Mark Z Danielewski goes up to the counter and orders a large coffee with cream and sugar. When it comes, he removes the lid and peers inside the cup. The coffee is black. He asks for more cream, but the coffee remains black, and the cup is never filled. He feels a new kind of horror take root inside him, a fear he knows he will never escape. He drinks his black coffee in silence. Jeffrey Eugenides goes up to the counter and orders five white chocolate mochas. A group of boys watches him from outside the Starbucks. They observe as he drinks each drink one by one, throws them out one by one, and exits the Starbucks, walking away down the street until they can’t see him anymore. Donna Tartt goes up to the counter of the art museum Starbucks and orders a passion brewed tea. She strolls through the empty halls, the domed archways, slowly sipping her too-hot drink. Statues move out of the corner of her eye. She hears a whisper in a long-dead language echo throughout the building. She carefully removes a painting from the wall, tucks it under her arm, and walks down a darkened hallway, the barista watching her receding figure. This is the only story he will ever be able to tell. Holden goes up to the counter to get a dark roast, but he’s forgotten all his money at home, so his little sister has to pay for it. He stares moodily out the window as he waits for it to brew, wondering where the ducks in the pond across the street go in the winter. Also, he’s pretty sure the barista is a phony. Lemony Snicket goes up to the counter and orders a caffé Americano. It is bitter. The barista is armed. The man in the corner has poisoned someone’s drink. The espresso machine is on fire. Lemony Snicket begins to run down the street as the Starbucks explodes. He is being chased. He spills his coffee.